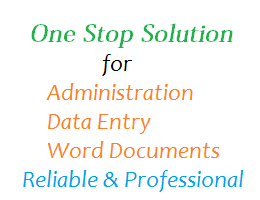 With this hourly, you also get the peace of mind as the responsibility of your admin / data entry / word document typing is with an experienced professional who can guarantee quality and flawless job delivered in 2 hours. 7. Converting the Word document to create, format and animate PowerPoint Presentations. 8. Assistance with the templates, layouts or designing of the document. If you have a job, I can help you with it. Get in touch with me with any of your requiments and I am sure you will be more than satisfied with the delivered work! I would require the documents and clear communication from you to deliver the job on time, every time. Top level and very efficient. Thanks Panna. Great job working with my slides to produce professional presentation formats. thanks Panna! It was lovely working with you Doreen. Hope to work on the next assignment soon! Panna did a thorough job and we will use Panna's services again. Thanks so much Jon, I am glad you liked the work. Hope to hear from you soon on your next assignment! Thanks Jon, it was lovely working with you this time.. Hope you will soon get back with more assignments! Panna worked, at last minute, to help get a report typed up very quickly. Many Thanks Jeff, it was great working with you! I am a graduate in Computer Science with more than 5 Yrs corporate experience in Recruitment and HR processes. I have worked in different levels from Consultant to Client Relationship...Read moreI am a graduate in Computer Science with more than 5 Yrs corporate experience in Recruitment and HR processes. I have worked in different levels from Consultant to Client Relationship Manager and have managed to deliver beyond client expectation. I have good work ethics and great sense of time and responsibility. With more than a decade experience in varied skills like MS Office, Excel, Virtual Assistant, Administration and coordination, I also have experience in Whiteboard doodle animation; writing article, website content and video scripts, website submission, Internet Research, hiring through social media network and several others. If you have any administration, recruitment, whiteboard animation or content writing based requirements, please get in touch with me. In case you need help with an area that is not covered here, still drop me your requirement and let me see how I can help you!